Wikimedia Philippines and Mozilla Philippines will hold their first Open Web Day for the year on February 25, 2012 at 2-6pm at Netopia Robinson's Place in Malate, Manila. 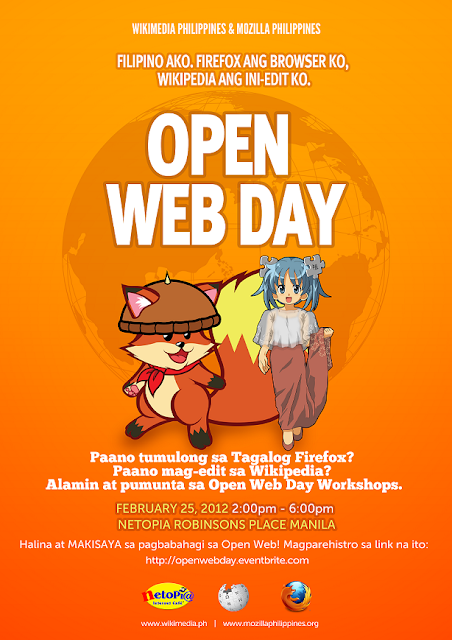 Open Web Day is a free mini-workshop that aims to teach how to edit Wikipedia entries online. Slots are very limited. Register only when you are sure to attend as to not waste the opportunity to learn from the workshop. To register, go to: http://openwebday.eventbrite.com. Those who officially registered and who will receive confirmation from the organizer will be admitted to the workshop. Please be guided accordingly.